Here’s another installment in the popular series featuring light music by Fred Waring and His Pennsylvanians. 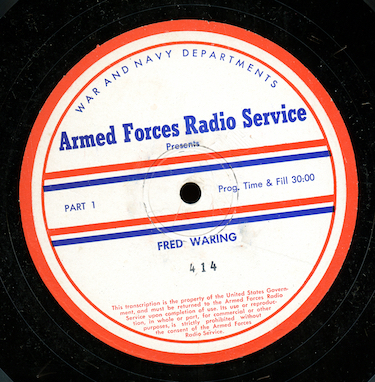 Originally heard on the Blue network on April 26, 1945, this is the Armed Forces Radio Service version, where it was distributed as program 414 in the series. The first song is “Tico Tico”. Our musical half-hour was dubbed direct to digital from an original vinyl Armed Forces Radio Service transcription disc. Many thanks to blog listener William Harris for his donation of the disc to the collection!